Jane D. Hill, a lead consultant for McREL, has worked in the areas of second language acquisition and special education for 28 years and now consults and trains nationally with teachers and administrators. Prior to joining McREL, Jane worked as a speech/language specialist specializing in bilingual special education for 13 years, directed a two-way language school for three years, and served as a district director for second language acquisition and special education for seven years. Jane has written for Language Magazine and the Journal of Staff Development and is a coauthor of the ASCD book Classroom Instruction That Works with English Language Learners (2006). Her most recent endeavor involves collaborating with state departments of education to offer the English Language Learner Leadership Academy, a long-term professional development program. Jane can be contacted at jhill@mcrel.org. Cynthia L. Björk is a multilingual principal consultant at McREL, where she works in the field of systemic school improvement for linguistically and culturally diverse learners. Cynthia holds a master's degree in education from Regis University with a focus in ELL instruction and language development. Prior to joining McREL, she worked extensively as a professional developer in schoolwide change. She has also worked as a bilingual classroom teacher, instructional coach, and district level coordinator and has taught graduate courses on bilingual and multicultural education, English as a second language methodology, and family and community involvement. 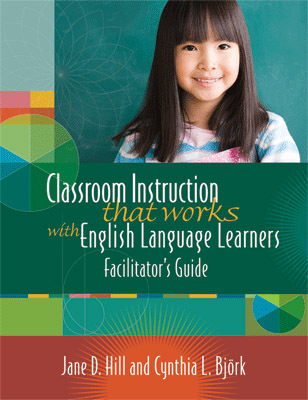 Cynthia facilitates workshops for Classroom Instruction that Works and Classroom Instruction That Works with English Language Learners. She can be contacted at cbjork@mcrel.org.